Now that summer is most definitely over, your hair may need a little extra pampering – it may have suffered a little more than usual and be in need of a bit of extra TLC after too much sun, chlorine and salt. If your hair is also fine and coloured, all those elements add up to a recipe for disaster. But don’t despair – I have the perfect remedy! If you’re looking for a little extra “oomph” in your hair, but with no heaviness or overpowering fragrances, I found this delightful hair mask. I used it when my hair was not only coloured, but also sun-damaged and in desperate need of a trim – it did the trick and saw me through a challenging time, hair-wise. Pure Volume Masque is a delicious and light – yet wonderfully creamy – preparation that you smooth onto your hair and leave to work its magic after shampooing. It’s a gentle and lightweight treatment for fine hair that adds moisture and nourishes deeply. The result is silky smooth but without weighing your hair down. Vitamin B5 adds volume and vitality, and results are long lasting. Their special Colour Guard Complex protects hair and reduces the loss of colour which comes with washing, heat styling, UV rays and free radicals. It’s produced by Maria Nila in Sweden with 100% vegan ingredients and is sulphate and paraben free. Plus, it smells absolutely divine! You’ll walk around surrounded by a gentle tropical garden scent to ease you gently into autumn. 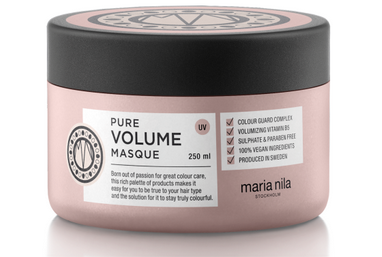 The Maria Nila Pure Volume Mask is priced at EUR 27. For more information go to Marianila.com. This entry was posted in Ethical, Haircare, Scents, Skincare, Wellbeing and tagged dry hair, Hydration, Maria Nila, post summer hair, Pure Volume Mask, Vegan, volume. Bookmark the permalink.